MINNEAPOLIS — Lance Lynn walked off the mound in frustration Tuesday, despite his most efficient outing for the Minnesota Twins. After pitching well for a season-high 6 2/3 innings, hitting a batter and walking another to end his night left a sour taste in the right-hander’s mouth. 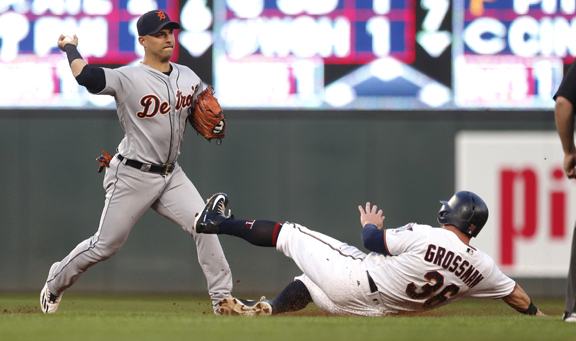 Brian Dozier drove in three runs with a pair of doubles to back Lynn, and Minnesota cruised to a 6-0 victory over the Detroit Tigers. Lynn (2-4) lowered his jumbo ERA from 7.47 to 6.34 in his ninth start of the year, striking out four and walking one while giving up five hits. Dozier’s two-run liner capped a three-run fifth for the Twins, who won their third straight game. Ehire Adrianza added a pair of RBI doubles. Detroit starter Matt Boyd (2-4) left with a left oblique spasm after walking his first two batters in the fifth. Boyd gave up two runs, one hit and a season-high four walks. The Tigers were 0 for 6 with runners in scoring position and have scored 13 runs while losing six of their past seven games.